Facebook, Twitter, Google+, not to mention phone calls, email’s, newsletters … it can be hard to stay focused at times. In fact, one of the hardest things I find as a Virtual Assistant is switching off. It’s difficult not to look at emails as they ping in to your inbox or not picking up the phone when it rings. But as more and more projects were coming it, I could see that my lack of focus was causing me problems. Time I’d allocated to projects weren’t being completed within that time-frame. So I decided to carry out a little experiment. Over the period of one week, I logged time against everything I was doing during the course of my working day. And when I say everything, I mean ev-er-y-thing! The time I worked on projects. The time I flitted off a project to check the email that had pinged in. The time I flitted on to another project because I’d had an idea. The times I went to the kitchen to make a cuppa, grab some food, or when I was staring aimlessly into the distance. The time spent on the phone. On social media. Surfing the web. Answering the front door to the postman. Toilet breaks. And the list goes on. The result of this experiment? My time wasn’t being used as effectively as I had imagined. I began to realise why projects were taking longer than estimated, or worse still, longer than what I’d quoted. So it was time to get productive. Here are some great tools that I found in my quest to stop distractions and stay focused on the task at hand, which may come in handy if you also struggle with productivity at times. Whitenoise Player. This takes a bit of getting used to, but it honestly does work. If you have children, perhaps you know this already, but for me it’s been great to help me block out distractions and get on with the task at hand. Just FYI – I find the gray noise much easier to get used too. For me, white noise is a little too annoying to ignore! Productivity Owl. This takes some getting used to and can be frustrating even when you have got used to it, but it’s definitely a time saver! First of all enter all the websites that you want to allow without any time restrictions. For example Google, project management sites that you use, Dropbox, client websites, etc. Next enter all the websites you want to block. These are sites you don’t want to allocate any time to throughout your working day. If you don’t manage social media sites for any of your clients, then you may want to add them here as we all know how much time can be wasted scrolling through the latest Facebook timeline! Finally, set the time that you want to allocate when visiting all other websites, and you’re done. 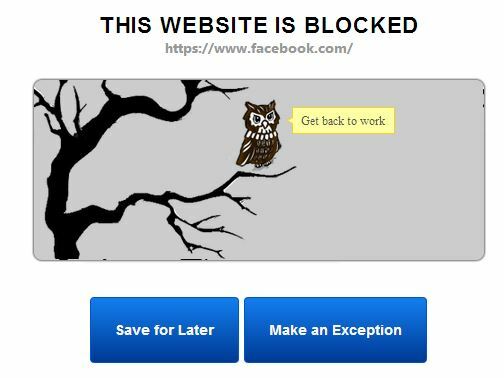 Just make sure you find the info you need quickly otherwise that pesky owl will fly across your screen and shut the site down. It takes a bit of trial and error in terms of timings, but this really is a great tool to help over-come procrastination and distractions online. Write Monkey. If you’re a VA specialising in content creation for your clients, then this is a fantastic tool. I’ve just started using it myself since I’m branching more into this area. It allows you to completely focus on your writing, therefore saving tons of time. It’s essentially a blank canvas. Literally. You can customise it as you’d like, but it removes all other interfaces so you can concentrate on the task at hand. Signals. How many times do you check your inbox to see if a client has responded to your email yet? It’s time consuming, and annoying! Signals takes away all that and I’m a big fan. Sign up to their free version and give it a try. It tracks when your email gets opened and lets you know. Compatible with Gmail, Outlook and Salesforce via Hubspot’s Chrome extension. Lastpass. The final one on my list I couldn’t live without. I’d become a bit of a worrier when it comes to internet security. So I would create different passwords for everything. But then I started worrying that I’d forget them all which would result in more time spent having to reset passwords. Lastpass takes away those worries. Create an account and a strong master password and that’s the only password you’ll need to remember again. It keeps all your login details secure giving you peace of mind. So tell me, what productivity tools can you not live without? Some great new tools Sarah, not heard of some of them but will check them out. I have used LastPass for a while now and wouldn’t be without it now, it’s also great to be able to login from a remote location (say when I am having to use Internet elsewhere on my laptop) and get all your logins in one secure place.